I used Pinterest recreationally before I began to use it to promote and drive traffic to my blog. Now Pinterest is a huge part of my blog. It's responsible for a large portion of traffic to my site, so I'm always on the look out for ways to make my images and my content more pinnable. 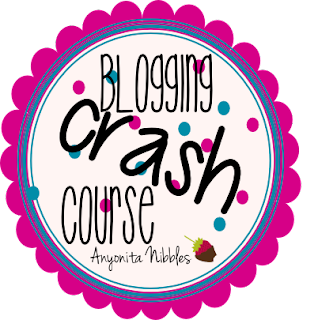 On my Tuesday link party, I pin every post that gets shared because I know the advantages Pinterest can have and the amount of traffic it can bring in and I want to share that with my party participants. 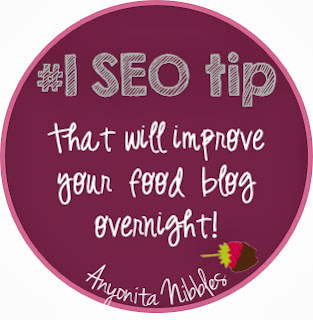 In doing my weekly pinning, I'm constantly coming across blogs that aren't taking proper notice of the one SEO trick that could catapult the pinability of their posts. I'm going to share that one trick with you. You might have guessed it from my word play, but it's the humble and too-often overlooked alt text. Many people overlook the alt text when adding images to their blog posts and websites. It's not really used in the mainstream anymore, although, according to the UK Equality Law of 2010, all UK business websites must make use of alt text or they could be sued for discrimination. That pesky alt text has suddenly become very important for UK businesses. I think everyone should pay it respect, though. And so do the developers at Pinterest. 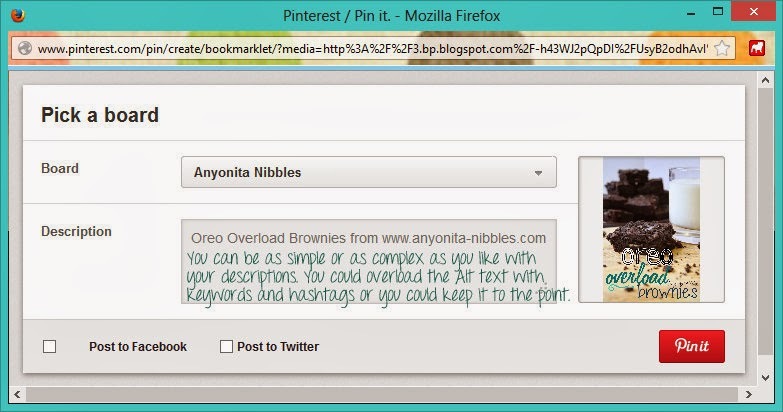 You see, as I explained in my Optimizing Photos for Pinterest post, Pinterest pulls the description of pins from the alt text. If you want control over what goes in the description, then you need to fill in the alt text! Don't leave it up to your readers to decide! With that first image, I didn't bother filling in the alt text at all. As you can see, Pinterest auto-filled the description with the title of this post. It's not the worst thing that could happen, but it's a bit misleading because the image and the description don't match up. With the second image, I did fill in the alt text and it has carried through to Pintersest. 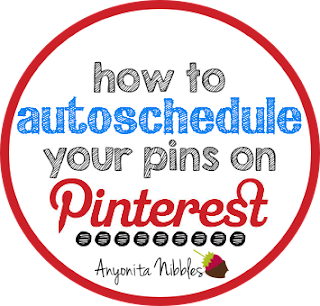 This is important because if you are in the habit of pinning your posts as soon as they are published, you are the first person to put them on Pinterest. You set the tone for the description. Just think, your description, if enticing and if it explains what's in the photo and what readers can expect, can encourage people to pin your content. 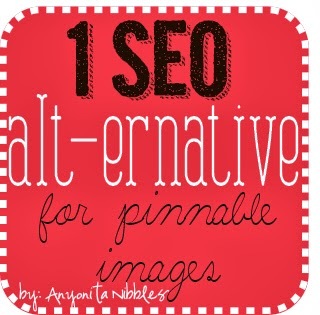 In other words, the secret to pinnable images isn't necessarily the image alone. It's also contingent on the Pinterest description. You could have the most beautiful photo on Pinterest but if it's unclear what's in the photo, if your Pinterest description is generic or lacking in clarity, it won't be pinned as often as if people knew what they were pinning! Makes sense, right? The image and the description in the above photo are poor because it is confusing. Does this image link to a post about SEO or is it a brownie recipe? If pinners can't tell, do you expect them to pin it? Furthermore, do you expect them to click to find out? By allowing Pinterest to auto-fill the description, you also miss out on the SEO opportunity within Pinterest. I've said that a big chunk of my blog traffic comes from Pinterest, but a big chunk of my search engine performance is also reflected in Pinterest. 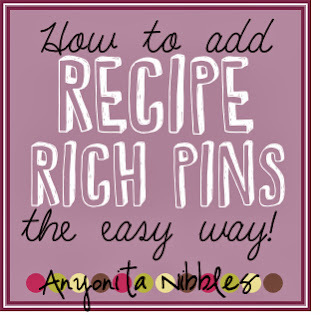 There are recipes that I can search for using my keyword and pins and Pinterest will be in the 3rd or 4th result on Google. That's good SEO and it's cost me nothing but an alt text. 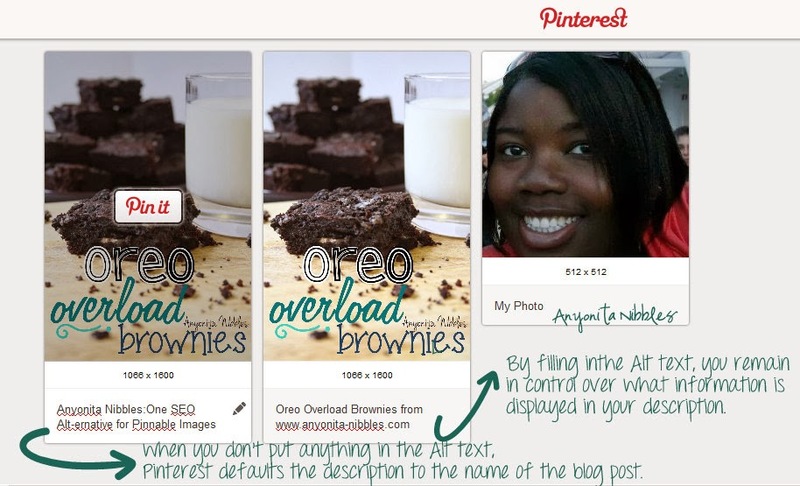 I tend to keep my alt text and my Pinterest descriptions, thereby, pretty simple. I'm not one for loading them up with hashtags and gimmicks. Of course, there's nothing wrong with this. It's just not my style. Develop your own style: use the alt text and description to really promote yourself,or keep it organic and laid back. It doesn't matter how much you put in, just put something in. Even if you only put in your keywords and your blog or website name, you'll reap the SEO benefits. If you are unsure of how to edit the alt text in your blog posts, check out this post for screenshots and a tutorial. 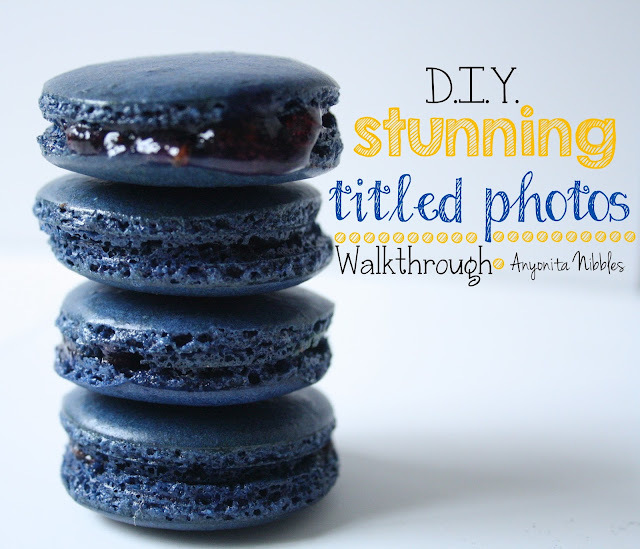 Do you edit the alt text on photos in your blog posts? Do you think it makes a difference to pinability? And if all those photos of brownies made you hungry, check out the recipe for my Oreo Overload Brownies!